You just got your baby to sleep and you open the door to leave the room…CLICK! Baby stirs, mom cringes. NO. ONE. MOVE. Did you make it this time? We hope so. If not, here’s a 3 second fix for that loud door clicking when you open and close the door. All you need is a rubber band. 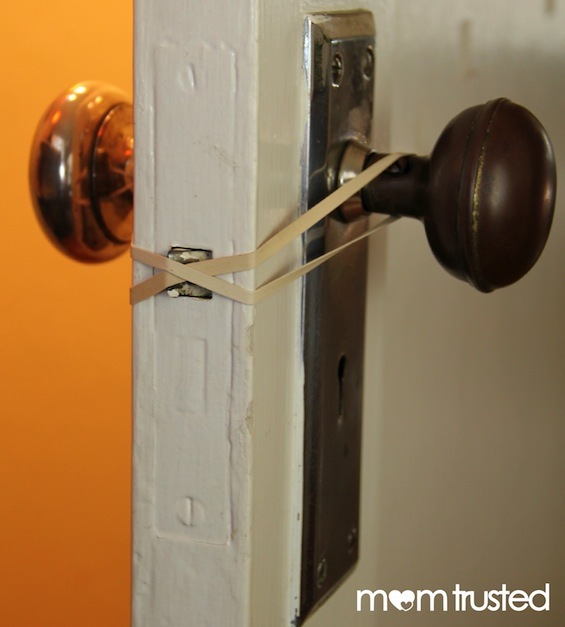 Loop the rubber band around one door knob, stretch it around the side of the door, twist it once in the middle over the latch, then loop the remaining end over the door knob on the other side of the door. Done! Open and close the door at free will without the hardware clicking. Check on the baby regularly while keeping the door closed to keep the noise out. It’s so easy! First Kid or Second Kid? … check out these hilarious Luvs videos on the changes we make as parents from the first child to the second child.